At the Amman airport yesterday, I ran into an old childhood friend and her family. Coincidence as neither one of us lives in Amman. Then we all ran into Arab Idol winner Mohammad Assaf and posed for a photo with him. Small world that got smaller when I realized 14 of the passengers on my return flight to Abu Dhabi had also been on my flight to Amman. Eleven of them were sitting in business class when I boarded. There was no mistaking them. Handsome dudes, I thought. But I was about to learn they weren’t dudes when three of them got bumped down to coach. It was a full flight, and I had thought I was lucky having the only empty middle seat, which lay bare between me and the Islamic fundamentalist on the other side, each of us sizing up who would claim the seat as his or her storage space. But then one of the three bumped down from business flapped its wings as it crawled over me with its trainer and claimed the seat with a spray of pee (bird not trainer). I didn’t scream or demand to be bumped up like the lady in the emergency row in front of me when the other two downgraded falcons joined her. 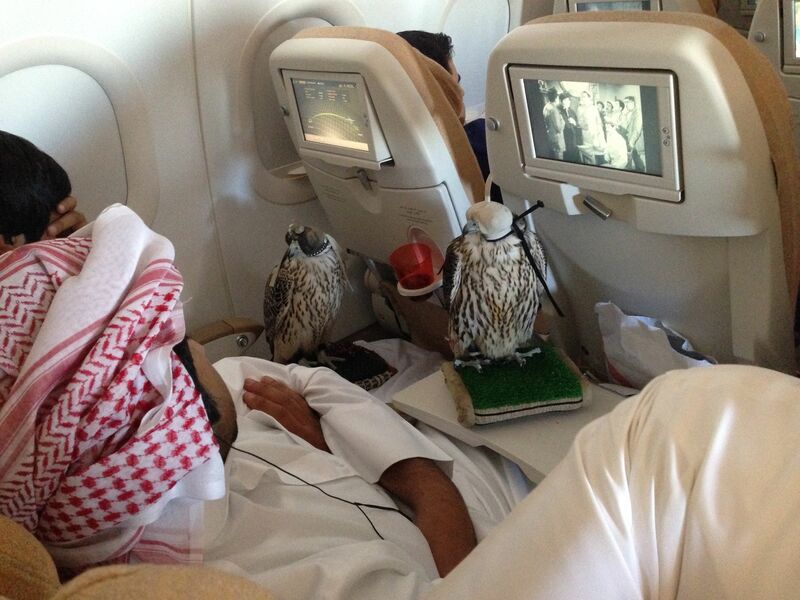 After all, the rearranging of these falcons had already delayed the flight almost an hour and their poop, which sparkled down the aisle, was beginning to stink. Normally I respect that the person sitting next to me on the airplane probably doesn’t want to talk with me. But with the trainer carefully petting the falcon on his arm, so that we could take off without any hysteria, I couldn’t resist. Just as I had heard Mohammad Assaf, also in business class, far from his home in Gaza, ask his friend how it is that falcons travel business class, I asked the trainer what they had been doing in Jordan. Unlike Assaf, I have lived in the Gulf long enough to know how venerated the falcon is—symbol of the UAE and the falcon hospital is one of the top medical facilities in the country. The trainer, who was dressed like an Emirati but was actually Bangladeshi, said they had been hunting in Jordan. But sometimes they hunt in Saudi, Pakistan, many places. Syria used to be good but now too much hunting of people. Their favorite hunting spot is Morocco. Our conversation proceeded with a mix of pigeon Arabic and English. I can’t resist using the word pigeon because that was what the falcon had for breakfast, one pigeon a day. We were joined in our conversation by the Muslim fundamentalist, who wasn’t really a fundamentalist but a charming, bright science professor. The falcon didn’t say much, just pooped on the floor and on the trainer’s dishdash from time to time and turned HER head very now and then as if that might help HER see through HER leather blinders. Indeed one of the first things we learned from the trainer was that female falcons are the real hunters. Bigger and more focused than the male falcons. (This reminds of a turtle I met in South Africa, but that is a different story.) The trainer told us his falcon was one of the top ones in the group. She was eight months old. He had been taking care of her since she was born, and I don’t think he could love his own child more. This falcon wouldn’t be having any babies until she was three or four and she would probably live to be around 10-years old, the age he was when he began learning the falcon training trade. She was worth $50,000, and maybe one day would be worth as much as $280,000, like falcon that a friend of his boss had. We also learned that the bird has full medical check up once a week. This was his indignant response to both the professor and I declining lunch service. I was thinking about the falcon pooping digested pigeon and remembering avian flu, but the falcon apparently was getting better health care than we were. We still didn’t eat, though. 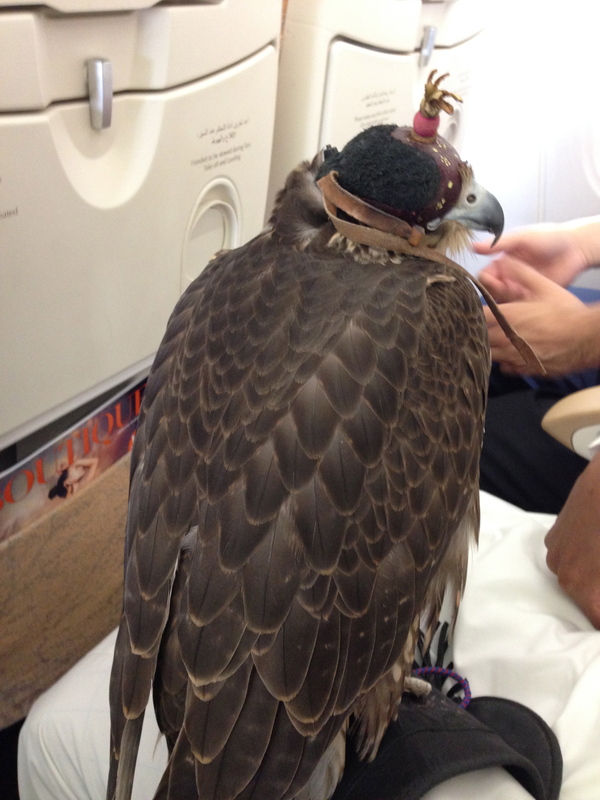 The falcon is a majestic, beautiful thing, like the adorable babies that you sometimes find yourself next to on flights. But when take off and landing freaks them out and you can’t get the smell of their poop off of you, then some of the majestic charm is gone. I don’t remember too many of the babies I’ve sat next to—but I’ll always remember my two trips with this lady and her personal trainer. I wondered if Mohammad Assaf was humming his hit Ya Tair al-Tayer (Oh Bird in Flight) for the other eight ladies still in business class. 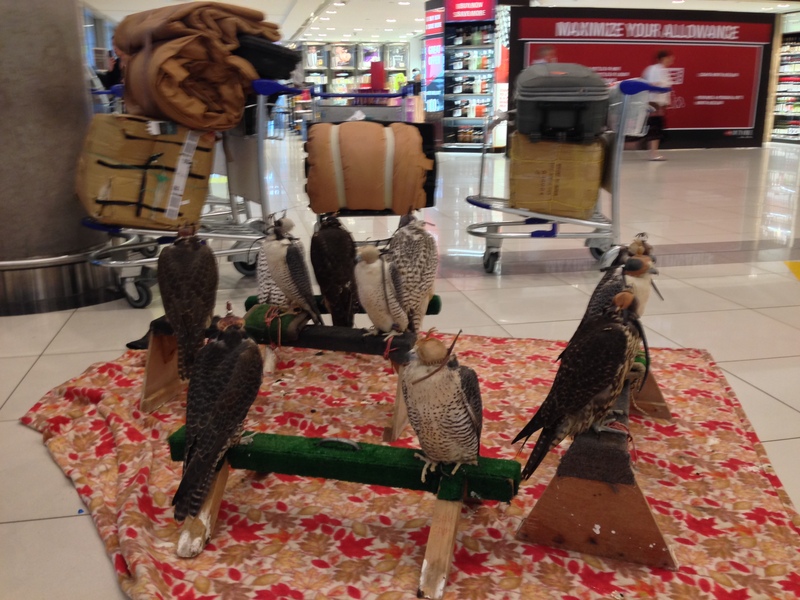 This entry was posted in Abu Dhabi, Arabs, Arts and Culture, Dubai, Jordan, Lebanon, Middle East, Travel and tagged Air Travel, Falcons, Flight, Hunting by Alia. Bookmark the permalink. Fascinating. Your pictures take it to another level too!